Lowell’s is ready to build! We are a working museum which means your boat will be built in a museum setting for the public to see. All of our work is done by professional boatbuilding staff trained through an unbroken chain of institutional knowledge. We source our lumber as locally as possible often cutting and milling trees ourselves. In addition, we use American Made fasteners, paints, etc. whenever possible and have most of our hardware produced by a bronze foundry in town. Below is a list of specifications and options though every boat we build is custom and can be built to the owners own wishes. If you want something built that we don’t already make, we can do that too! All inquiries can be sent from this page. The straight and high-sided Lowell Banks Dory was developed in the early nineteenth century to meet the needs of the Banks fishermen. This sturdy, seaworthy and economical boat was ideal for hand lining from a parent ship and could be stacked in transport utilizing a minimal amount of space on deck. In addition, Banks Dories have an exceptional ability to carry heavy loads and actually gain stability as they are laden. Their success was quickly recognized, and Lowell’s has built and shipped nearly a hundred thousand to fishermen and lifeguard stations in all parts of the world. The Banks Dory is an excellent rowing boat and continues to be the choice of rowing clubs and lifeguard associations across the country. In the spring of 2006, the Long Beach Lifeguard Association of Long Beach, California commissioned Lowell’s Boat Shop to build a Banks Dory to commemorate their centennial and be “worthy of the rich rowing tradition in Long Beach Lifeguarding.” The east to west business between the Boat Shop and Long Beach has been ongoing for over seventy-five years, and, remarkably, dories purchased in the 1930’s remain in service today. 16′ 62″ 18″ 280 lb. 18′ 66″ 19″ 340 lb. 20′ 70″ 20″ 400 lb. 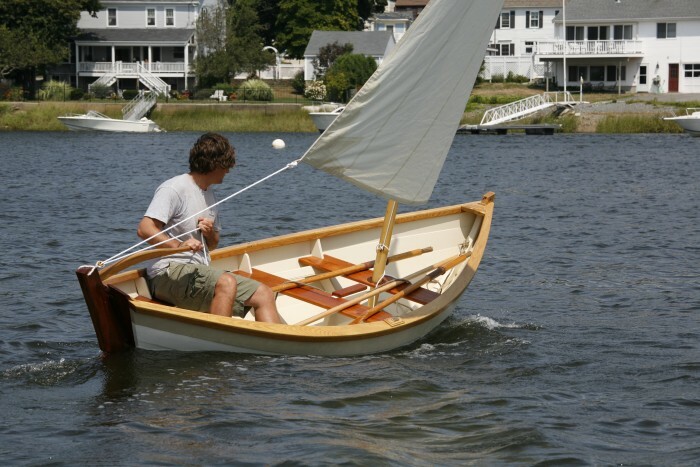 The round-sided Surf Dory, often referred to as the Swampscott-type dory, was developed from the original dory designed by Simeon Lowell with the founding of his shop in 1793. Even after the later development of the Banks Dory, fishermen who had to come into the beaches through the surf preferred the Surf Dory. The rounded bilges give extra buoyancy amidships, taking the boat up and over the waves onto the beach. As a result of the success of this design, the U.S. Life Saving Service, forerunner of the Coast Guard, used these dories for life saving missions for almost a hundred years. Surf Dories are wonderfully seaworthy boats and more stable when light than the Banks Dory, thus we offer them in shorter overall lengths. They row extremely well and, because of their outstanding stability, lend themselves even better to sailing and family boating than the Banks Dory. Our standard Surf Dory and Sailing Surf Dory hulls are offered from 14’ to 20’ overall. 14′ 59″ 17″ 230 lb. 16′ 61.5″ 18″ 280 lb. 18′ 64″ 19″ 340 lb. 20′ 68″ 20″ 400 lb. 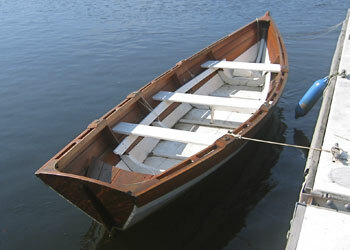 The round-sided Surf Dory, often referred to as the Swampscott-type dory, was developed from the original dory designed by Simeon Lowell with the founding of his shop in 1793. Even after the later development of the Banks Dory, fishermen who had to come into the beaches through the surf preferred the Surf Dory. The rounded bilges give extra buoyancy amidships, taking the boat up and over the waves onto the beach. As a result of the success of this design, the U.S. Life Saving Service, forerunner of the Coast Guard, used these dories for life saving missions for almost a hundred years. Surf Dories are wonderfully seaworthy boats and more stable when light than the Banks Dory, thus we offer them in shorter overall lengths. They row extremely well and, because of their outstanding stability, lend themselves even better to sailing and family boating than the Banks Dory. Our standard Surf Dory and Sailing Surf Dory hulls are offered from 14’ to 20’ overall. 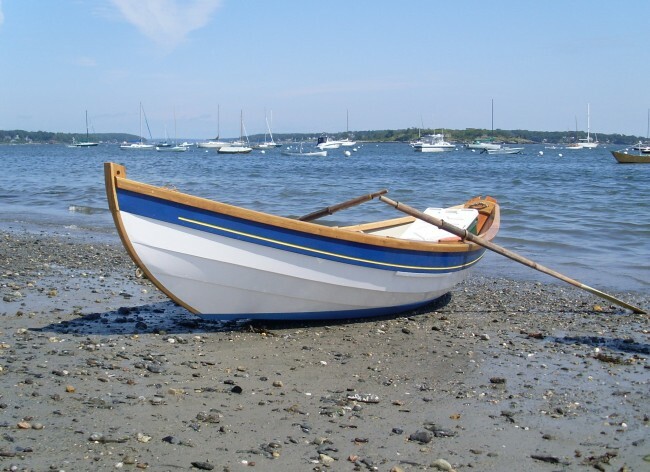 Inspired by the original Surf Dory, the Salisbury Point Rowing Skiff was developed by Lowell’s Boat Shop in the 1860s for recreational use on the river. The boat shown is the original design that was built until the mid-1920s when outboard motors became widely available. When recreational rowing returned to popularity, this lovely and seaworthy rowing skiff was recreated from original patterns by master boat builder Fred Tarbox and continues to be one of our most sought after models. 13′ 54″ 15″ 185 lb. 15′ 56″ 16″ 210 lb. 17′ 58″ 17″ 245 lb. 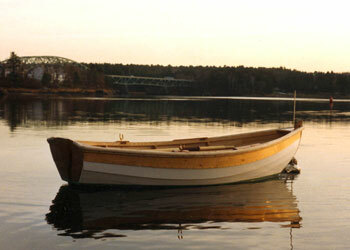 The Lowell Atlantic is a light variation of our Salisbury Point Rowing Skiff that was originally introduced for recreational use in the 1860s. The Atlantic is designed for use on the open ocean by the experienced sculler or by the beginning recreational rower who wants a fast, safe family boat. Traditional lines, exhilarating speed, and excellent sea-keeping abilities make this beautiful boat a joy to row. At 150 pounds, the Lowell Atlantic can be easily launched and recovered single-handedly. 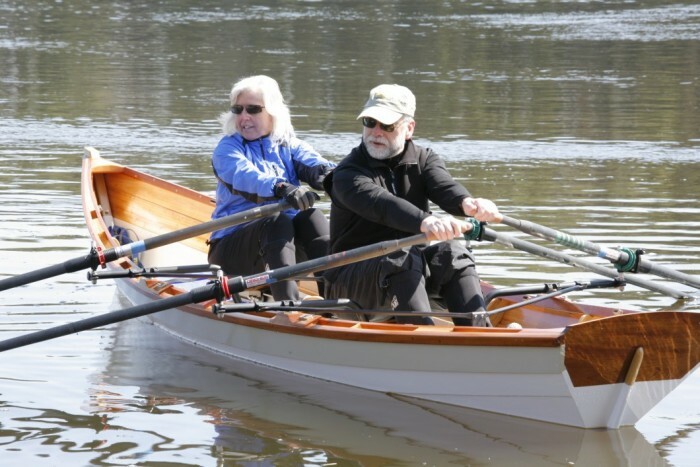 The Lowell Atlantic can be rowed by one or two people from standard stationary seats using standard oars; or, it can be fitted with a removable sliding seat for solo use. 15′ 44″ 13″ 150 lb. 17′ 46″ 14″ 190 lb. Over the past eighty years, the Lowell Amesbury Skiff has earned a reputation for being an exceptionally stable, seaworthy, and rugged boat. An adaptation of the Surf Dory, it was initially developed for inboard power and is now modified to take advantage of contemporary outboard engines. The hull is flat-bottomed with flared, rounded, lapstrake sides, making these boats surprisingly dry and easy to maneuver. Since power requirements are lower than most boats of equivalent size and capacity, fuel requirements are also low – an important consideration in today’s world. Commercially, Amesbury Skiffs have been used primarily for livery, fishing, and rescue work. The Amesbury Skiff is an ideal and extremely versatile family boat. Stern side seats and two thwart-ship seats are standard; steering and control consoles and lockers are optional. 12′ 62″ 18.5″ 200 lb. 14′ 64″ 19″ 245 lb. 16′ 77″ 21″ 300 lb. 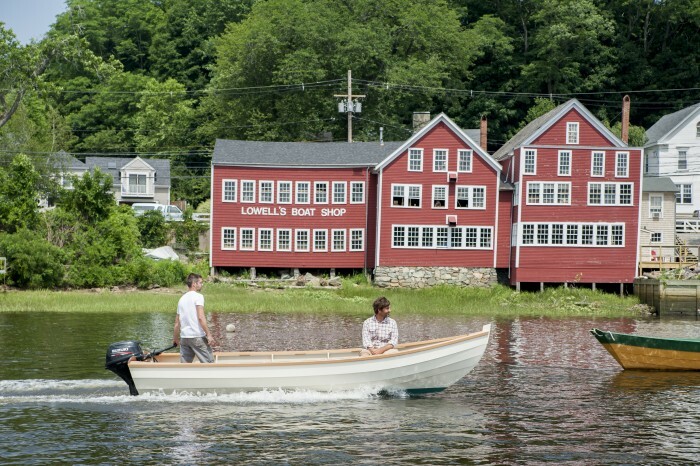 Derived from the time-tested Asa Thompson Skiff, the Deer Island Skiff is the newest edition of small rowing tenders that are built at Lowell’s Boat Shop. Named after the small island that splits the Merrimack River below the boat shop, the Deer Island Skiff has become a popular choice for families as well as the serious yacht owner. 10′ 48″ 13″ 115 lb. 12′ 51″ 14.5″ 150 lb. 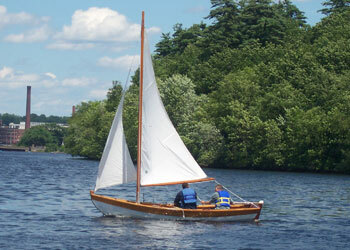 The Lowell Merrimack Skiff is designed to be a pleasure to row and enjoy on the water. 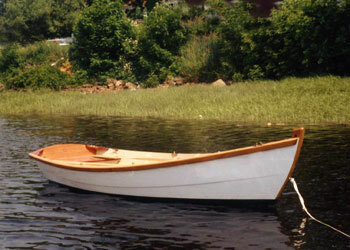 This variation of the Salisbury Point Skiff dates from the 1920’s when outboard motors were first being developed. It is widened at the transom to more easily handle a small outboard motor, and has a single rail and three planks per side to lessen the cost of construction. An upscale fifteen-foot version of this versatile craft that is featured at the Mohonk Mountain House is also available with a double rail and brass half-oval rub strips. Lowell’s Merrimack Rowing Skiffs have been used by generations of fishermen, campers, Boy Scouts and Girl Scouts, and rowing enthusiasts. They have proven to be extraordinarily seaworthy, safe and sturdy — boats built more than thirty years ago are still in use. Comfortable and easy to row, this skiff is outstanding for both oar and motor. For traditionalists, a notch can be cut in the transom for sculling with one oar. 12′ 52″ 16″ 160 lb. 14′ 54″ 18″ 200 lb. The Lowell Tender is a delight to the discerning yachtsman who imagined that such craft only exist in nautical museums – to be seen but not owned. Four lapped planks per side on three sets of white oak frames give it a deep, graceful hull that is excellent for rowing heavily laden as well as for towing. In addition, it is stable, dry, and seaworthy – a capable and elegant little workhorse. In recent years, Lowell Tenders have been markedly improved. The hulls have been deepened to allow even the 9’ model to carry four adults and row exceptionally well. The bottom and garboards can be sealed with epoxy, dramatically reducing maintenance and allowing “dry sailing” from a float, ship’s deck or trailer. Still, these boats are essentially as Lowell boats have always been: graceful, seaworthy, rugged dory-built boats. 9′ 50″ 14.5″ 118 lb. 10′ 51″ 15″ 130 lb. 12′ 52″ 15.5″ 170 lb. The Lowell Sailboat is the only model from Lowell’s Boat Shop that is designed with sailing performance as the primary consideration. With its outstanding performance by oar, sail or power, this boat is the most versatile, all round recreational design known to us at Lowell’s Boat Shop. It has a lapstrake dory-type hull of traditional design that has been modified to provide fast, able performance with safe sturdy construction. Oars are all that are needed to navigate when there is no wind; however, the broad transom easily accommodates a small outboard engine. Sprit rig, Lug, and Marconi are standard options while a variety of sailing rigs are available depending of the boat size and the buyer’s preference. While the sizes listed below are standard, we are able to build the Lowell Sailboat in any size ranging from 12′-20′. 12′ 60″ 17″ 155 lb. 14′ 63.5″ 18″ 200 lb. Sallie Hyde is an exceptionally able and comfortable open motorboat–a small boat which will prove ideal for many purposes: fishing, day cruising or earning a living for some water minded man. For the latter it may be of interest to know that the draft of this latest of the family is only 1 foot 4 inches, carrying the weight of two grown-ups as crew. The over all length of Sallie Hyde is 22 feet 3 inches; the water line length is 20 feet; the extreme breadth, 6 feet 10 inches; and the draft as given above. The freeboard at the bow is 3 feet 6 1/2 inches, the least freeboard, 1 foot 11 inches, and the freeboard at the stern, 2 feet 5 inches. The depth amidships from gunwales to top of keel is 2 feet 11 inches; and so one can see she is a very big little boat. People aboard sit well down in the boat thus assuring a sense of security to the crew, to say nothing of placing the center of gravity of the live load where it should be in any small boat — low. The deck plan shows a truly open boat: no decking, only inwales, edge of sheer strakes and fender mouldings forming the deck edge of the topsides. There is a cockpit both forward and abaft the motor housing, the well deck forming seats and a very comfortable place for sun bathing forward. Gasoline tanks are installed both sides beneath the well deck, motor controls are on the enginehouse and the little packet steers with a handy certain-and-sure tiller. The original plans showed for power a two-cylinder four-cycle medium-speed Palmer marine engine, model H.H. ; approximately 12 h.p. at modest turns per minute. However, a Gray Lugger 162 was installed in the first boat. The designed speed with the Palmer engine is 9 miles an hour. The Gray, of course, propels the skiff somewhat faster than this, but develops more power than is required which, after all, has its advantages. Sallie Hyde has all the worthwhile characteristics of the old fashioned and dependable Sea Bright fishing skiff; the bold sheer line, raking stem and stern, box deadwood, flat bottomed double-ended keel, and outdoor rudder. Two big changes, however, are noticeable; she is of V-bottom model and carvel (smooth)-planked. 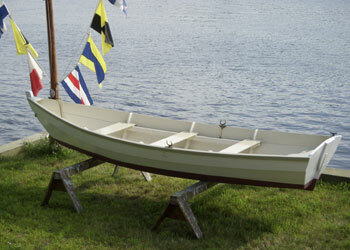 Since long before the Civil War all the famous Jersey coast skiffs have been of round bilge model and clinker planked. Therefore the design of Sallie Hyde is a development of the old timers. Yacht finish: Varnished rails, transom, breast hook and seats. At Lowell’s, we work with each customer on an individual basis and consider each boat a custom order. Please inquire for additional details on building and delivery options. 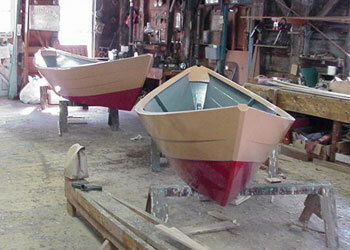 At Lowell’s Boat shop we specialize in flat bottomed dories and dory-skiffs. We build several in-house designs in various sizes, most of which can be adapted for sail. Our Amesbury Skiff is our option for power and can be built in sizes ranging from 12 to 22 feet. For the rowing enthusiast we suggest the Atlantic Rowing Skiff or the Salisbury Point Skiff; for the traditional sailor we build the Sailing Surf Dory and the Lowell Sailboat, and for dinghies and general use we build the Lowell Tender, Deer Isle Skiff, and Merrimack Skiff. All of our models are variations of original Lowell’s designs built from patterns that have been in the shop since the 19th century. While we offer any of our boats of entirely traditional construction, many of our customers tend to blend old and new methods by having the bottom and garboard encapsulated with fiberglass and epoxy—a method commonly used for those who intend to have their boat spend the majority of its time on a trailer.